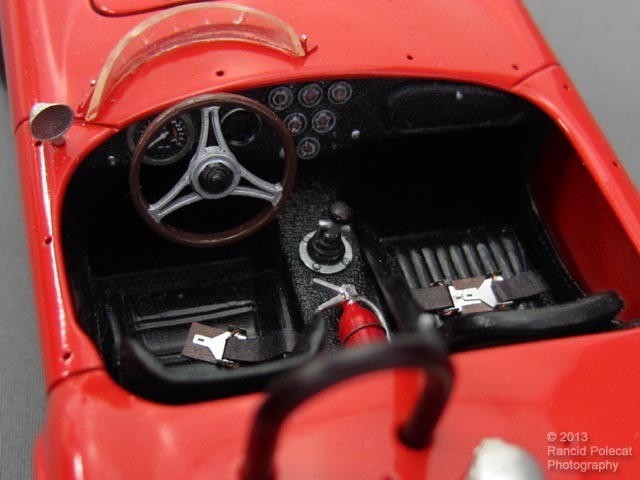 JC added a period-correct Raydot rear view mirror from Sakatsu and a clear resin racing wind screen from Historic Racing Miniatures. On the dash gauges are surrounded by photoetch trim rings and detailed with decal faces, except for the speedometer which has been blanked out -- the race cars didn’t use speedometers. While the passenger seat is the stock unit that came in the AMT kit, JC reworked the driver's seat from a Monogram GT 350R Mustang kit to fit. Lever-type seat belt harnesses are Detail Master products and the fire extinguisher is from JC's parts box. You can also see where he reshaped the top edge of driver’s side door to replicate a modification that was done to increase elbow room as the Cobras often got sideways.